Limit of 10 characters, please! if you choose a baseball hat, leave initials and hat color in the comments box! Check your email very soon if you wanted a proof! We're fast! Our custom personalized Little Me water bottles are perfect for birthdays and holidays. Design a water bottle to look like your child! 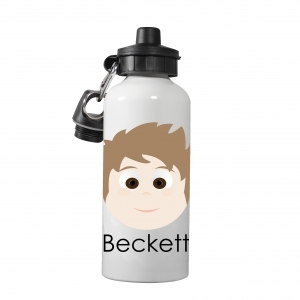 Your child will squeal with delight when they recognize themselves on their very own personalized Little Me water bottle. Our Little Me collection are personalized dishes made to look like your child. Customizing is really easy. Choose hair do, hair color, eye color, skin color and cheeks to create an image of your child. You can even accessorize with hats and glasses. How fun! Kid-friendly, 20 oz. white stainless steel. Stainless steel inside so it's BPA free. Dishwasher-safe but please do not put in the microwave.